For Saw Gerrera, the Empire is something that must be fought, no matter what the cost or the tactics used. As a grizzled veteran of many conflicts, he has been leading the fight against tyranny since the Clone Wars. His radical viewpoints may put him at odds with the rest of the Rebel Alliance, but Saw remains steadfast in his beliefs, turning his Partisans into an effective fighting force unafraid to take extreme actions to further their cause. Order your own copy of Saw's Renegades Expansion Pack at your local retailer or online through our website today! His cadre of freedom fighters makes use of much the same equipment as the rest of the Alliance, including their own complement of starfighters. But, as a splinter group, Saw and his followers prefer to do things their own way, making some interesting changes to their T-65 X-wings and U-wings. 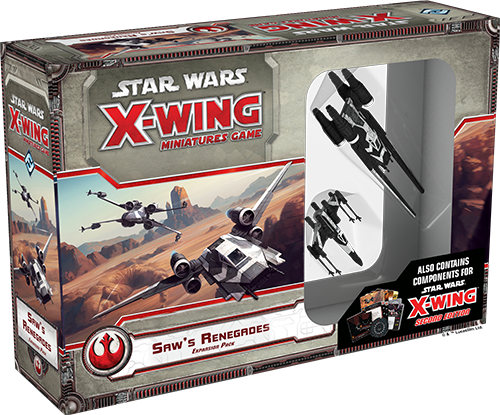 The Saw’s Renegades Expansion Pack brings a distinct edge to the Rebel Alliance forces of X-Wing™. 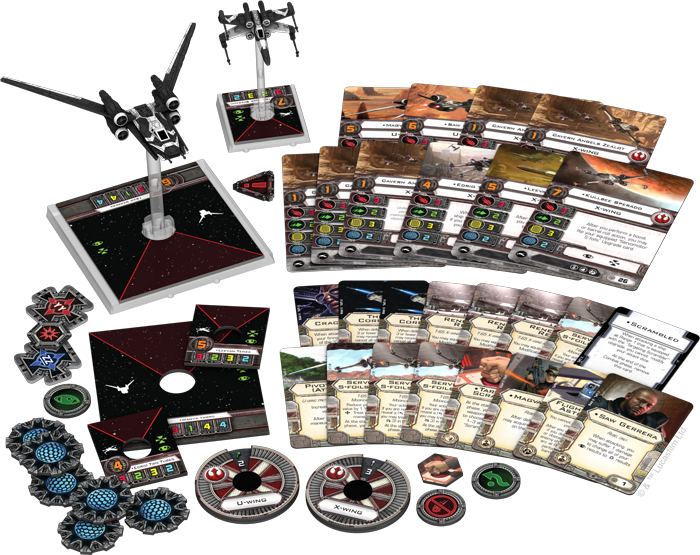 Featuring both a U-wing miniature and a T-65 X-wing miniature sporting the distinct black-and-white paint scheme of Saw and his Partisans, this expansion also offers an assortment of ship and upgrade cards that take both ships in exciting new directions. 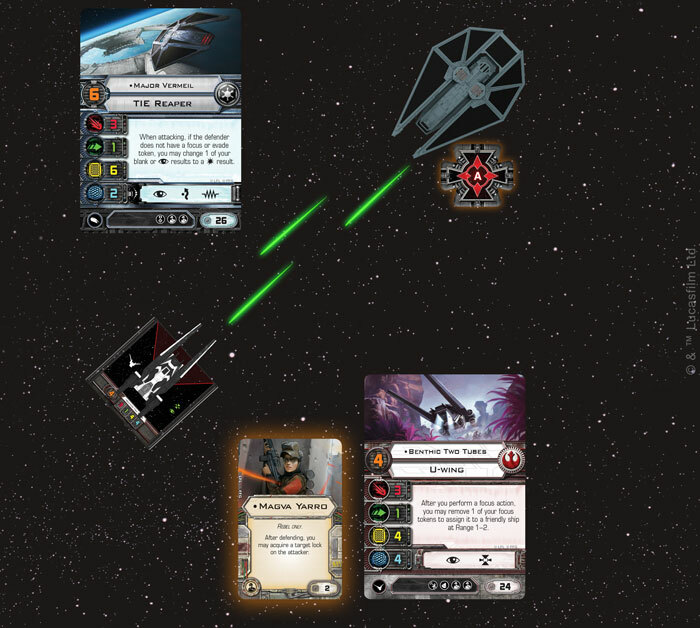 Join us today as we take a closer look at the Saw’s Renegades Expansion Pack for X-Wing! Despite the long odds, Saw’s band of freedom fighters zealously fly their starfighters into battles that others deem hopeless. To have any chance, they need to get the most out of their customized ships. 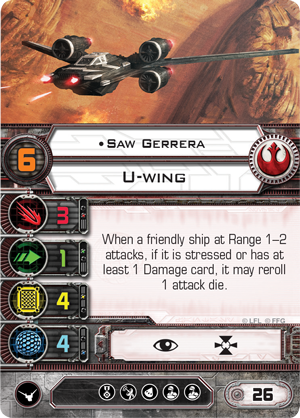 For this reason, the Saw’s Renegades Expansion expands the capabilities of the T-65 X-wing beyond anything that has previously been seen with a new dual-sided upgrade card. From the moment they began their attack on the Death Star in Star Wars: A New Hope, it was evident that the T-65 X-wing performed differently with its S-foils set in different positions. 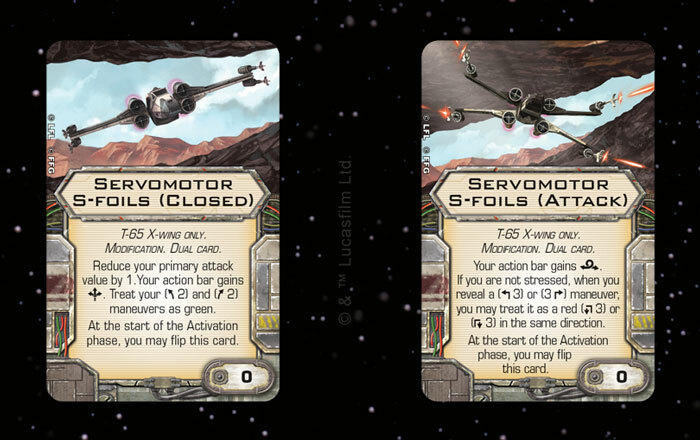 Now, this functionality makes its way into X-Wing with the Servomotor S-foils modification. Not only do the S-foils on the T-65 miniature included in this expansion physically open and close, this upgrade gives it new abilities while flying in these configurations. With its S-foils closed, a T-65 becomes a bit speedier, gaining the boost ability and treating its two-bank maneuvers as green. This does cost the ship a bit of firepower, however, reducing the T-65’s primary attack value by one. If you want to attack with full force, you’ll need to open your S-foils into attack position at the beginning of the Activation phase, gaining the barrel roll ability and the opportunity to treat your speed-three turn maneuvers as speed-three red Tallon rolls. With Servomotor S-foils equipped, the T-65 becomes an even more versatile fighter, capable of both getting into position for a quick attack and slipping out of harm’s way. Appropriately, many of the pilots included in the Saw’s Renegades Expansion Pack sync nicely with the addition of Servomotor S-foils. 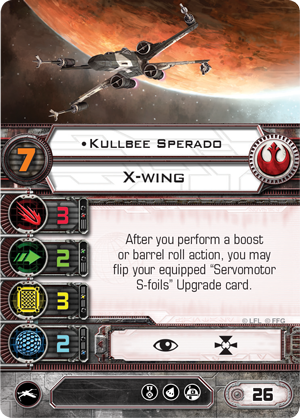 Kullbee Sperado, for example, lets you quickly change the position of your S-foils after performing either a boost or barrel roll. 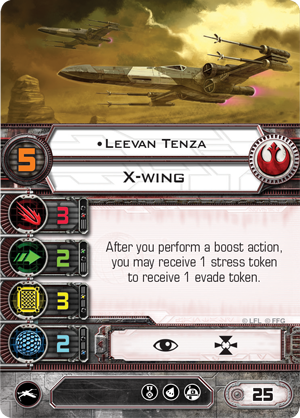 Similarly, Leevan Tenza capitalizes on the advantages of closed S-foils with the ability to receive a stress token to receive an evade token after performing a boost. In addition to T-65 X-wings, the Partisans also prefer the hardiness of U-wings, with Saw Gerrera himself often entering the fight in one of these. As we noted in our preview of the U-Wing Expansion Pack, the ship’s two crew upgrade slots and Pivot Wing upgrade make it a formidable gunship and troop transport. But where the cards in the U-Wing Expansion Pack focused on military espionage, those found in the Saw’s Renegades Expansion Pack tend to be more directly confrontational. 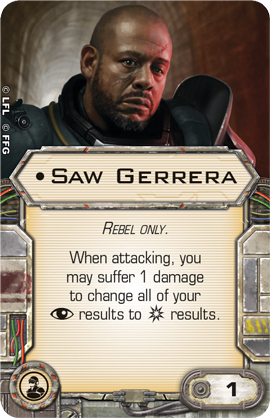 For example, if you choose Saw Gerrera as a pilot, friendly ships in the thick of the fight can reroll one of their attack dice while they have stress tokens or damage cards. 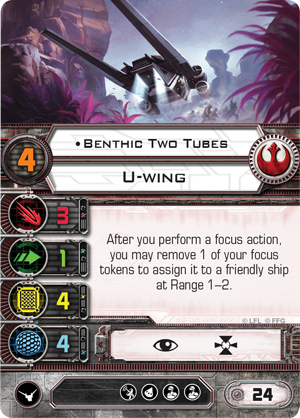 Benthic Two Tubes, on the other hand, can assign focus tokens to nearby friendly ships, the perfect way to help out an X-wing closing in for an attack. With Magva Yarro as a crew upgrade, Benthic Two Tubes can aquire a target lock on Major Vermeil after he attacks. This target lock can be spent for a quick retaliatory strike when Benthic Two Tubes attacks later in the combat phase. The crew options made available in Saw's Renegades are no less aggressive. True to character, Saw himself isn’t afraid to take extreme action to get results. While he’s aboard your ship, you can suffer one damage to change all of your focus results to critical damage, potentially harming yourself a bit to inflict massive damage on the enemy. Meanwhile, Magva Yarro helps you quickly get back at anyone who fires at you, allowing you to acquire a target lock on the attacker after you defend. 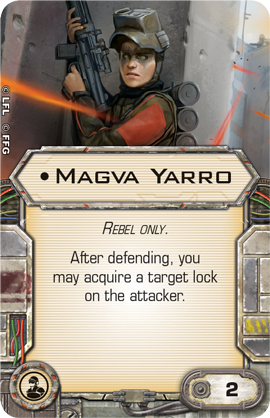 If Magva is on a ship with lower pilot skill than the attacker, it's possible to spend that target lock during the same combat phase to send a dangerous retaliatory strike back at your opponent. Although they share similar goals with the Rebel Alliance, Saw’s Partisans clearly have their own way of doing things. They are willing to attack targets that others would never think of attacking and they have no problem resorting to violence and coercion when others would choose diplomacy. They take this same approach to modifying their starfighters. Where more traditional Rebel pilots are satisfied with the standard complement of upgrades and secondary weapons of their T-65s and U-wings, the Partisans are willing to take things a step further. 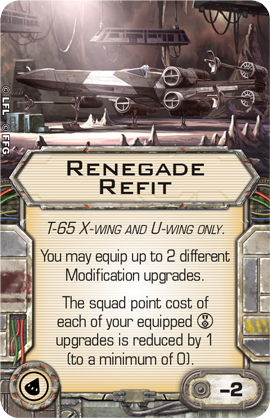 Within the Saw’s Renegades Expansion Pack, this is most clearly shown by the Renegade Refit for both the T-65 X-wing and the U-wing. Eschewing the torpedoes common to many starfighters, the Partisans prefer their ships to be a bit leaner. Not only does this upgrade have a negative squad point value, it also allows you to equip a ship with two different Modification upgrades while reducing the cost of any Elite Pilot Talent upgrades you equip on that ship. The chance to add in the Renegade Refit opens up all sorts of intriguing possibilities for building your squadron. For example, this upgrade allows you to field five Rookie Pilots equipped with Servomotor S-foils, an R5 Astromech, and Integrated Astromech, giving you a hearty squad of powerful starfighters that can easily overwhelm an unwary opponent. Even amongst other Rebels, Saw Gerrera is seen as an outcast who does things his own way. His rebellious spirit permeates Saw’s Renegades, shaking X-Wing to its very core. Join his fight for freedom and end tyranny across the galaxy! Keep the dream of the Rebellion alive with the Saw’s Renegades Expansion Pack (SWX74), available now for pre-order from your local retailer or our website!